The PL4+ gas control unit represents the best technology for the detection of flammable, toxic or Oxygen compounds in small systems. The PL4+ has 4 analogue 4-20 mA inputs that can be extended to 8 by using the 4-input expansion board PL4/ESP, easy to plug in the control unit. The panel is housed in IP65 ABS box with a 12Vdc 1.5 A power supply integrated. Mode status LEDs for alarms and fault warning along with the backlit LCD display provide for real time gas concentration reading. Alarms are user selectable and for each input it is possible to set the type of detector, its full scale range and the alarm thresholds. The panel can be easily programmed via the three position key-switch for Set, Unset and Program along with the Reset and Acknowledge push buttons. The panel comes complete with 5 output relays: one for each threshold (AL1, AL2, AL3), 1 for fault (FLT) and 1 auxiliary and freely programmable. 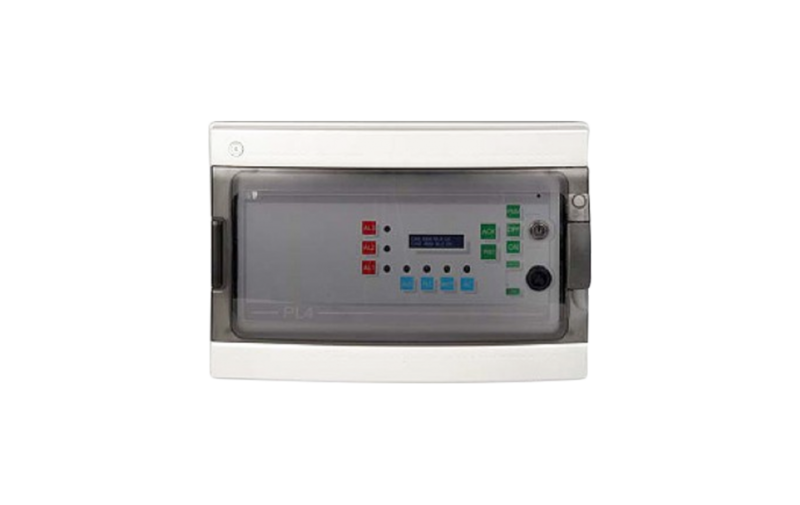 By using the 4-input expansion board, the panel can have a further 16 Open-Collector outputs linked to the second and third alarm thresholds (AL2 œ AL3) of each detector connected.